This course is designed to get you up to speed fast using 3DS Max and VRay as effective design development and presentation tools at every stage of your process. 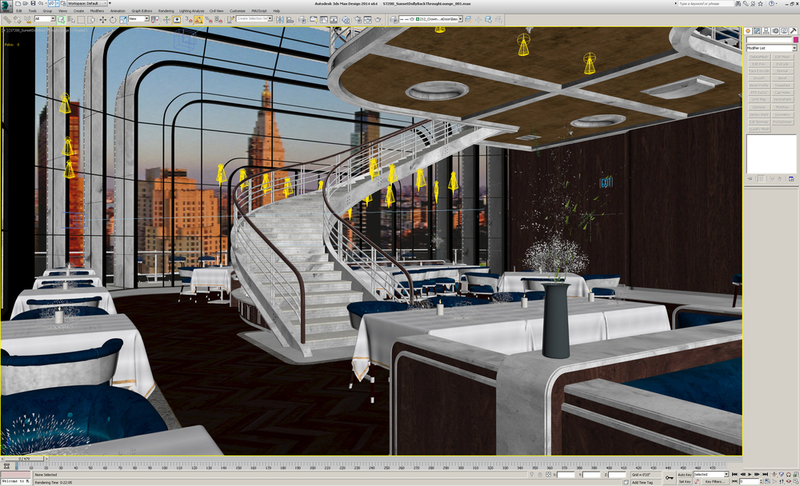 It aims to take the mystery and frustration out of using the software best suited to architectural visualization by teaching you what you absolutely need to know and also letting you know what you can safely ignore. You'll learn production-proven methods for modeling that allow you to explore design alternatives and adapt quickly to changes. You'll learn to use materials and lighting effectively and efficiently so that they contribute to design evolution rather than slowing you down. You'll learn how to organize and manage project file structures for effective collaboration, rapid iteration and painless integration with BIM. The goal of every lesson, every exercise, every bit of information presented will be to help you up your game by making computer modeling and rendering as natural as sketching and a useful, fluid part of your everyday design process. Professionals in architecture and other design-related fields who already have substantial experience with 3D modeling and rendering but want to boost their digital visualization skills, exploring and expressing design possibilities in ways that resonate powerfully with clients and translate more seamlessly into buildable results. If you're tired of having to rely on someone else for renderings in order to convey your design intent and want to take back control of the design process, this course is for you. DATES: This is a two-day course that takes place over a single weekend. It will be offered at least two weekends each month (assuming sufficient enrollment). The minimum class size is two people, the maximum is eight. In the event that you have registered for a class that does not have sufficient enrollment two days prior to its start date, you will receive a full refund of your registration fee and priority in registering for a future date of your choice. TIME: Each day of instruction begins at 9AM and wraps up at 6PM with a one hour break for lunch. Complimentary coffee, tea and filtered water are available throughout each day, but students should expect to make their own arrangements for lunch. Understand and use advanced modeling methods to express and refine design concepts faster. Optimize materials and geometry as you work in order to improve rendering efficiency. Understand the unique requirements of modeling for 3D printing or CNC milling and how to make sure your geometry will yield good results in fabrication. Understand and optimize VRay render settings to get the best possible results in the least amount of time. Organize large, complex project files effectively to better facilitate collaborative design work. A Five-Minute History of Computer-Generated Imagery. Biased vs. Non-Biased Rendering Engines. Squeezing the best possible performance out of the hardware you have. System Unit Scale and why it's so important. What you really need to know about Gamma. The Universal Coordinate System and why staying as close as possible to the origin will help you stay sane. Understanding the Object Transform Matrix and knowing when it needs to be reset. Understanding the Slate Material Editor and making node-based shader networks work for architectural materials. Best practices for file organization: Layers vs. Groups vs. Selection Sets vs. XRefs. Building and maintaining a model and material library that's actually useful. What you really need to know about Deterministic Monte Carlo (DMC) sampling and how to choose the right settings in every situation. Understanding Trace Depth and BSP Tree depth and their impact on speed. Understanding image filtering and texture filtering and when you can get away with disabling one or both for faster, more efficient rendering. Understanding color mapping and how to use it effectively. VRay materials -- Best practices for optimizing speed vs. quality. Bump maps vs. normal bump maps vs. displacement. Which to use when. Understsanding the VRay physical camera and why it makes sense to use it. Understanding the Irradiance Map and Light Cache and how to make them work most efficiently. Brute force as a viable alternative to the Irradiance Map and Light Cache. Editable Mesh vs. Editable Poly. Which to use when and why. Managing modifier stacks and balancing performance/stability with editability. Exploring design options with subdivision surface modeling. Best practices for typical interior modeling scenarios. Best practices for typical exterior modeling scenarios. Best practices for modeling context. Getting useable geometry out of Revit. And back in. Exploring design options through rendering: How to get useful results fast enough to make deadlines. Material studies: Accurately simulating reality vs. representing a desired result. Best practices for managing texture maps. Size and quality vs. memory overhead and speed. Best practices for lighting interiors. Best practices for lighting exteriors. Exploring design options through post-production: Using mattes and elements effectively. Making distributed network rendering work for you. Best practices for organizing project files in a multi-user environment. Using Asset Tracking and the Resource Collector effectively. Establishing firm-wide layer-naming, G-buffer ID and Render Element standards. Understanding proxy geometry and when to use it.